A beautifully executed 17th Century rapier with a very complex hilt and faceted pommel. The grip is hand wound with silver plated wire with woven wire rings top and bottom. The hand forged, high carbon steel, fully tempered blade features a wide fuller to lighten and strengthen it for thrusting and the heavy ricasso provides extra strength to the main stress area. Top quality, genuine leather scabbard with deeply engraved floral pattern on the throat and tip. This type of sword was deadly effective as a dueling weapon. Made by Windlass Steelcrafts®. 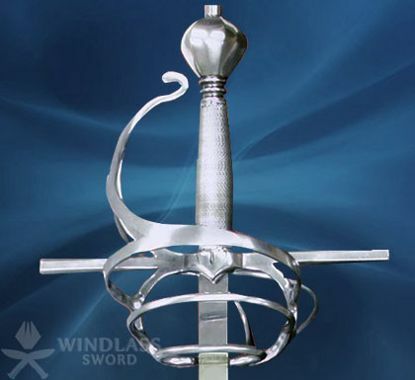 This stunning 17th century rapier has an expertly crafted swept & twisted metal basket. 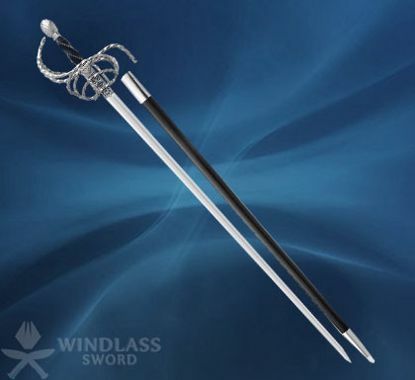 The heavily carved horn grip mimics the elegantly twisted metal of the hilt and is hand wound and inset with a single steel accent wire that provides an excellent grip while dueling. Better yet was the aristocratic, dashing look it gave the wearer while rakishly hanging from the belt. Hand forged, high carbon steel blade with flattened oval cross section. Extended, custom engraved ricasso for strength. 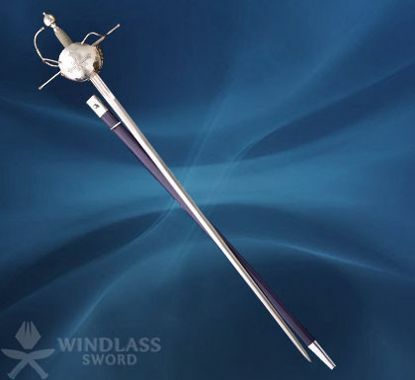 Includes leather scabbard with twisted metal accents completing this magnificent and fast rapier. Made by Windlass Steelcrafts®. The musket, though the prime weapon of the French Musketeers, was a cumbersome firearm, both to load and fire. A good rapier was a necessary second weapon. Our Musketeer rapier is fashioned after those circa 1590. The basket hilt is ambidextrous and a very effective mix of both the cup-hilt and swept-hilt styles. The grip is wood wrapped with twisted wire and the parts of the hilt are plated with gleaming nickel silver. Can be sharpened for additional fee. Matching main gauche available. Made by Windlass Steelcrafts®.